Due to inclement weather, the meeting scheduled for tonight, Thursday November 15 2018, is CANCELLED. Voting on the 2019 budget is deferred to the December meeting. December 1-2 Margy will have a table at a holiday craft show hosted by local jewelry artist Hilary Shank-Kuhl at 106 South Fullerton Ave in Montclair. 5% of all proceeds are donated to a local soup kitchen. Last year they gave close to $600 to Toni’s Kitchen, which was then matched by another local charity. Net proceeds will benefit NJMQG. Such as a small quilt, table runner, tote bag, potholder, set of coasters or place-mats, or small art piece that doesn’t quite fit in your house. Items must be good quality–something you’d like to receive as a gift. They could be something you’ve already made, but haven’t found the right recipient for; or something you make while making a grocery tote for our gift exchange. If you have a donation please contact Margy (president@njmqg.com) so she can arrange to get it before Dec 1. December 13 drawing for our Cloud 9 quilt at the Holiday Party, $5 donation. Time to finish and submit your QuiltCon 2019 entries! We’re getting close! QuiltCon quilt entries close at the end of the month: November 30th. Time to finish up your quilt! There’s still time, but hurry! Use this handy guide to take photos that make your work shine. Watch our judging and jurying webinar panel from last year for some pro tips. 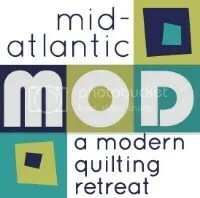 Visit quiltconentry.com to read the full rules and enter your quilt. Submissions are open until 11:59pm Central time on Thursday, November 30th. Once the clock strikes midnight, the system shuts down. Beat the deadline by finding the corresponding time in your time zone. Reminder to our ten lottery winners, IF we don’t have your money by Friday, please email Margy regarding your intention to attend the retreat. Info regarding actual sign up will be sent to you this weekend. Amy and Ameri have pieced the blocks, are adding borders, and will soon be passing it to Diane for quilting. Wow!! Many thanks to everyone who participated! 26 attendees had a fabulous time sewing, eating, yakking, eating, sewing, and sharing, sharing, sharing…! Looking forward to seeing all the stitching! Betsy showed 2 quilts: “Mini Mandala” and “New Directions”. Mel received 3rd place for her group quilt “Women’s Work“. Kudos and congrats to you both! Our successful free motion quilting class taught by our very own Jackie Laba. (Angela Walters better watch out!) Keep practicing and show off your new skills at the Dec meeting! We will be sending a sign up sheet to get an idea of the number of people who will be participating. There will be a link to the pattern attached to the sign up sheet and on the blog. This will be going out on Saturday November 24. Please bring your tote bag gift-wrapped to the holiday party Dec 13th. We will be doing a blind swap. You do not have to follow the pattern “exactly” – the goal is to have consistency in sizes. Feel free to embellish, quilt, or add a little something something to the tote. We have such talented members, we can’t wait to see what people make! Renewals will open in December after the budget is approved. Watch your inbox for a link to the registration form. Your 2019 membership will be confirmed upon receipt of payment AND completion of the online registration form. See you on at the Holiday Party on December 13th!